Charles Ernest "Chuck" Grassley (born September 17, 1933 in New Hartford, Iowa) is the senior U.S. Senator from Iowa. He has been Senator since 1981. He was also in the United States House of Representatives from 1975 to 1981. Before that he was in the Iowa state legislature from 1959 to 1974. 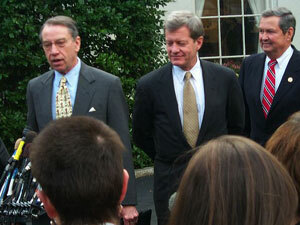 Sen. Grassley, Sen. Max Baucus (D-MT), and Rep. E. Clay Shaw (R-FL) (left to right) address the media after a meeting at the White House with President Bill Clinton. Chuck Grassley Facts for Kids. Kiddle Encyclopedia.